The RPS Julius Isserlis Scholarship offers young musicians the unique experience of studying abroad. Many grant winners have gone on to have fantastic careers – not least the very first recipient of the award, pianist Stephen Hough, whose grant assisted his Master’s studies at the Juilliard School. 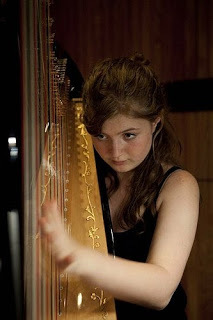 Following in his footsteps is harpist Emily Hoile, who also chose to study at New York’s Juilliard School with the help of a £10,000 Julius Isserlis grant in 2011. A second award from this year’s Julius Isserlis Scholarship enables her to complete her studies there. Helen: What attracted you to the Juilliard School in particular? Emily: The main reason I applied to Juilliard was because of the harp teacher there, Nancy Allen, who is the principal harpist of the New York Philharmonic. One of my favourite recordings that I owned was of her playing the Ginastera harp concerto so from there I found out that she taught at Juilliard! Besides Nancy, I think one of the things that really stood out to me about Juilliard was the range of performing arts that people study there. Along with having a fantastic music department, they have equally inspirational drama and dance divisions. Helen: What repertoire are you working on at the moment? Emily: I have just taken part in the USA International Harp Competition so for the past few months I have been pretty much exclusively working on the repertoire for that. It encompassed some of the well know standard pieces of harp repertoire such Fauré’s Impromptu for harp and Reinecke’s Concerto, but besides that there were some lesser well known harp works: transcriptions of Scarlatti sonatas for example, as well as a 40 minute recital of your own choice of music. As part of that I have transcribed a couple of works – my favourite is ‘Wiegenlied’ by Strauss, originally for soprano with piano accompaniment. I think there’s just something quite special about the way it works with the sound and resonance of the harp. At the moment I’m thinking about what new pieces to learn this year so am having fun just reading through a lot of music, from the standard harp repertoire as well as some possible piano transcriptions! Helen: What do you most enjoy playing? Emily: I really enjoy playing a lot of different styles of music. Since studying at Juilliard I’ve discovered that I really love playing modern music, either solo or in an ensemble. I think as a harpist it’s quite easy to be in your own bubble of solo harp music with it’s distinctive style, that to be in a group, playing extremely challenging music both harmonically and rhythmically, where everyone has to be 100% committed is really refreshing. Later this month I’m really excited to be going to Finland to perform with Juilliard’s new music ensemble ‘Axiom’ and musicians from the Sibelius Academy conducted by Susanna Malkki. Helen: What have been the highlights of your time at Juilliard so far? Emily: There have been so many! Getting the chance to perform ‘sur Incises’ by Boulez in my second year was incredible – a mammoth 40 minute work for three pianists, three percussionists and (most importantly, obviously) three harpists. That was probably one of my favourite, and most challenging ensemble concerts that I’ve ever played. Also, earlier this year I organised a collaborative performance of Caplet’s ‘Le Conte Fantastique’ for harp and string quartet. It’s a piece based on the Edgar Allen Poe story ‘The Masque of the Red Death’ so we had a student narrate as we went along, as well as four dancers in my year who choreographed certain sections to heighten the drama. It was really fantastic getting to work with students from the other divisions in the school and learning how they work and think. It’s fascinating. Helen: New York is a long way to take a harp! How have you managed the distance in terms of transporting your instrument? Emily: I have been very lucky, in that Juilliard owns ten harps that the harp students can use at any time. Whilst I would have loved to take my harp with me, it ended up being easier practising on the school harps and using them for rehearsals and performances. The main difficulty with this is that you don’t get so much chance to work with one specific instrument and really discover all of its nuances and sounds, but it does make you more flexible and adept at playing many different instruments, something that you have to do a lot as a harpist. Helen: How have you found living in the US, especially considering you moved there just after finishing school? Helen: It was quite a funny move. I think that due to the lack of a language barrier that I wasn’t expecting there to be too much of a culture shock. Turns out there are quite a lot of differences between the UK and New York, from the ways in which people interact to the fact that you don’t get a takeaway pizza, you get a takeaway slice. At the end of the day I didn’t find it too difficult to get into the swing of things over there, it was definitely an exciting time so all the differences made the experience more interesting! I lived in the Juilliard dorms for two years, so immediately when I arrived there was a welcome ‘Orientation’ week (the US version of freshers, minus the alcohol) where everyone from the students to the staff were extremely friendly and welcoming. Having lived in New York for three years now I’ve really settled into the way of life – albeit a crazily busy and fast paced one – and am looking forward to really making the most of my final year there! Helen: What do you hope to do on graduating from Juilliard? Emily: After graduating from Juilliard I’d love to get out, work with lots of different musicians and artists and just perform! Practically speaking, I need to decide whether to stay in the US and work there, or whether I should move somewhere new and discover a new artistic culture (or in fact return to the UK). So at the moment I am thinking through different ideas and looking into different options- it’s exciting and scary in pretty much equal measures. Helen: What advice would you have for young musicians who are looking to study abroad? Emily: If you want to do it, go for it! Studying in a different country is fantastic as it really gives you time to settle into a new place and experience it for a good length of time. Musically it also really interesting studying somewhere completely different, as you can get so used to the way you usually work, and being in a new environment with its own way of thinking and working sort of shakes that up forcing you to think in new ways. I’ve had an awesome time being a student in such a vibrant city, meeting some fantastic people from all over the world, both students and teachers, who I have learnt so much from. The RPS Julius Isserlis Scholarship is a biennial award which offers up to £30,000 for a young instrumentalist to study abroad for a period of two years. It is open to all classical instrumentalists of any nationality between the ages of 15 and 25 who are permanently resident in the UK. The next closing date is 13 March 2015. Please visit our website for further information. Jennifer Johnston, mezzo soprano, on performing Beethoven’s 9th Symphony at the BBC Proms (RPS’s 200th birthday Prom) on Sunday 11 August 2013. Beethoven Super Sunday gets off to a flying start! 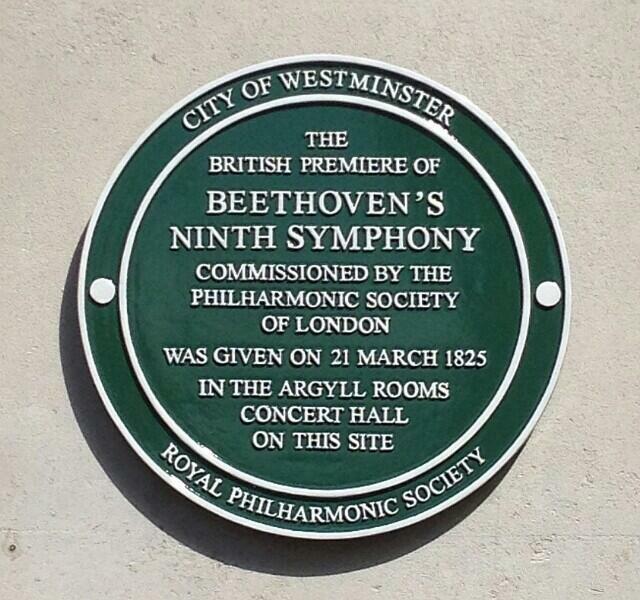 A green plaque commemorating the first UK performance of the RPS’s most famous commission, Beethoven’s 9th Symphony, was unveiled yesterday on Regent Street. 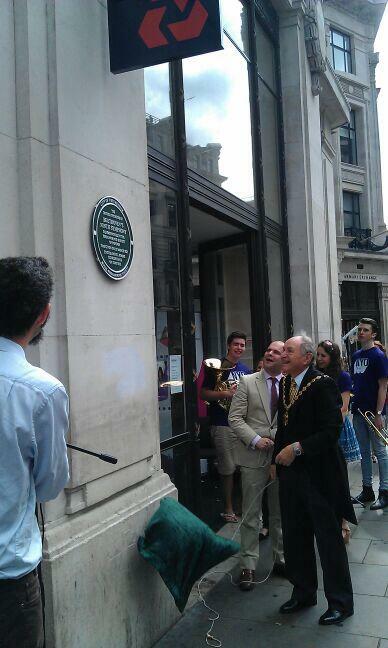 The plaque marks the former site of the New Argyll Rooms, which is now a NatWest bank. It was unveiled by RPS Chairman, John Gilhooly and Councillor Michael Brahams, Deputy Lieutenant of Greater London. The occasion was accompanied by a new fanfare by Bertie Baigent, a young composer from the National Youth Orchestra, performed by players from the NYO. Then it was straight off to the Royal Albert Hall for more Beethoven 9 celebrations with the NYO at the BBC Proms. (Take a look at last week’s blog, where NYO musicians talked about the unforgettable experience of playing at the Proms). Beethoven’s 9th Symphony was preceded by the world premiere of Frieze, a Beethoven-inspired RPS co-commission by English composer Mark-Anthony Turnage. 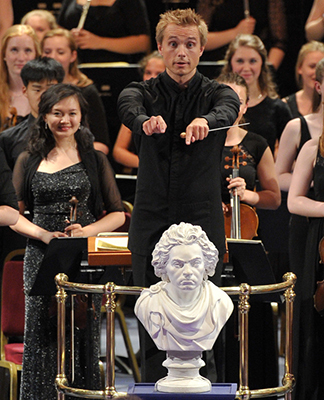 The NYO shared the Royal Albert Hall stage with singers from across the British Isles – and of course the Society’s bust of Beethoven, who kept an eye on proceedings from his perch in front of Vasily Petrenko’s podium. Not so dissimilar, then, to the 1824 premiere of the 9th Symphony in Vienna, when the by-then profoundly deaf composer stood behind the conductor to guide the tempo. Beethoven was oblivious to the applause which erupted at the end of the work, until one of the soloists turned him around to face the audience. Rapturous applause from a packed Albert Hall also greeted last night’s performance – a fantastic end to our Beethoven Super Sunday. Huge congratulations to all the performers! Missed the Prom? You can listen on iPlayer until 17th August. The concert will also be broadcast on BBC4 in 2 parts on 18th August and 6th September.